Davana is imported worldwide for its sweet fragrance and illustrious medicinal values and is used to glorify the idol of Lord Shiva in India. Botanically known as Artemisia pallens, Davana is a member of the daisy family, Asteraceae. Regionally called as davanam in Tamil and Davana in Kannada, this fragrant herb is indigenous to the southern parts of the Indian subcontinent. The essential oil of Davana is extracted from the stem and leaves of this herb by steam distillation method. It is widely used in Ayurveda in the treatment of mental disorders, nervous problems, depression, cough, cold, measles, infections, diabetes and high blood pressure. Having its roots deeply set in the religious traditions of the Indian Culture, Davana essential oil has an extensive application all over the world. It was used in traditional Ayurvedic medicinal formulations as an aphrodisiac and mood elevator. Davana was a part of the Indian folklore medicine for treating diabetes mellitus and high blood pressure. With much regional importance, Davana essential oil gained global attention only in the mid of the 20th century after which it has earned a special spot in the hearts of perfumers’ and flavorists’, particularly in United States and Japan where it is a flavor ingredient for bakery, tobacco and beverage products. The flowers, stem and leaves of this plant are used as an effective antiseptic and disinfectant for quick treatment of wounds, cuts and infectious ailments such as cough, cold, measles etc. Davana essential oil has also been a part of other Complementary and Alternative medicinal practices like Unani and the Traditional Chinese Medicine (TCM). Davana essential oil comprises of davanone, a major sesquiterpene ketone and other essential components such as linalool, dehydro-a-linalool, terpinen-4 oil, isodavanone, nordavanone, davanafurans, methyl cinnamate, ethyl cinnamate, bicyclogermacrene, davana ether, 2-hydroxyisodavanone, and farnesol. 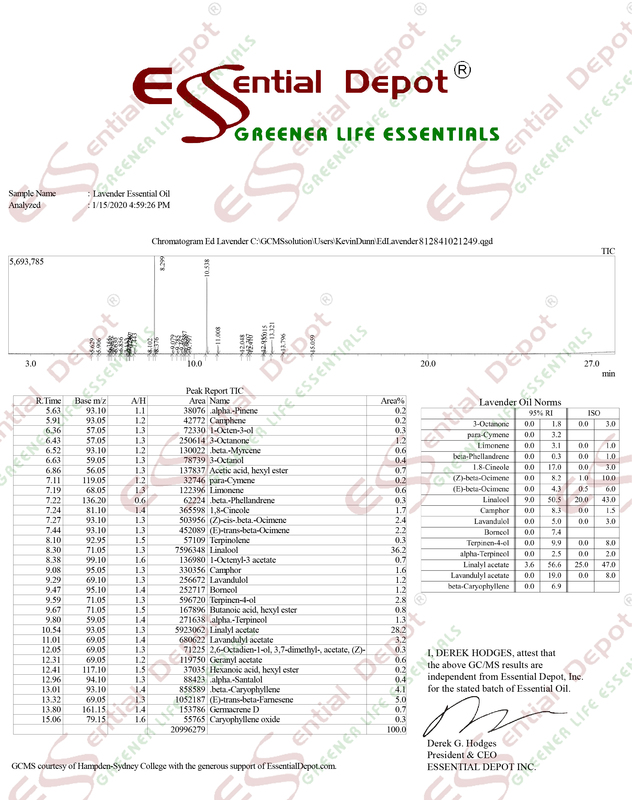 All these compounds of Davana oil attribute to its unique aroma and its medicinal values. Well recognized as a herb of sacred values, Davana essential oil benefits mankind with its anti-depressant, aromatic, antiseptic, antiviral, antimicrobial, anti-fungal, antispasmodic, decongestant, disinfectant, emmenagogue, anthelmintic, stomachic, hypotensive, antioxidant, expectorant, relaxant, vulnerary, aphrodisiac, nervine and mucolytic properties. Ayurveda is a holistic healing system that has its origin in India, the land of tradition and the world’s oldest history for more than 5,000 years. Just like this ancient remedial science, Davana herb also has its nativity vested in India and never fails in treating illnesses with its remedial aroma. Ayurveda suggests natural remedies for treating mankind as it believes that everything is a part of nature and Mother Nature has innate medicines for healing health disorders. 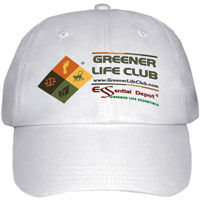 An individual is said to be healthy when his/her mind, body and soul are in perfect balance with nature. Illness according to Ayurveda is an opportunity to explore, restore and re-establish absolute health and strike balance with nature. Just as nature, human body is also made up of five vital elements namely fire, water, earth, air and space, built in the form of three vital biological energies known as doshas. They are kapha, vata and pitta doshas. The predominance of any one of these doshas determines the personality, character and behavioral attributes of a person and balance between these doshas stand for health and heartiness. Ayurvedic healing starts with the identification of the unique individual constitution that helps in determining doshic qualities, mental and physical attributes of an individual. Ayurveda does not follow the ‘one size fits all’ healing methodology as it trusts that every human being is unique in nature and the remedies for their illnesses should also be unique as per their constitution. The nobility of Ayurveda rests in treating the root cause of an illness instead of curing its symptoms alone. By treating the actual underlying cause, Ayurveda helps in preventing such illnesses in the future and paves way for longevity through healthy aging. The most predominant Ayurvedic remedies are herbs, essential oils, meditation, yoga, physical exercises, healthy lifestyle, prayers and an Ayurvedic routine. Davana essential oil is said to pacify vata and kapha imbalances and has a neutral effect on pitta dosha. Being a natural antiseptic with less toxicity, Davana essential oil is used to treat both internal and external infections. It destroys the micro organisms affecting the internal organs of the body like kidney, bladder, urethra and urinary tract, thus putting an end to sepsis, a fatal inflammation of the whole body. A 2009 research on ‘The antimicrobial screening of Artemisia pallens’ published in the International Journal of PharmTech Research, USA states that the extracts from Artemisia pallens possess antimicrobial activity against the bacteria Bacillus cereus. Davana herb extracts and its essential oil have been used in Ayurvedic practices for healing wounds and deep abrasions quickly and to curb the spreading of infections to other parts of the body, which might otherwise result in tetanus. Davana essential oil also has anti-viral property that strengthens your body’s immune system to effectively work against viral attacks. Having the ability to penetrate the protective layer of the virus called cyst, it kills viruses without a trace. Because of this attribute, it has been extensively used to treat viral infections such as cold, cough, influenza, measles etc. The best way to use Davana oil for arresting the spread of infectious micro-organisms is in Abhyanga or the art of Ayurvedic massaging. Mix 5 drops of Davana oil with 3 ml of coconut oil and massage your body, followed by a warm bath with 2 drops of Davana oil diluted in bathing water. The therapeutic properties of this oil penetrate through the skin and start its healing mechanism. You can also mix 1 drop of Davana oil with 10 drops of olive oil and apply it on wounds and abrasions for quicker healing. Widely used in the field of Ayurvedic aromatherapy for its anti-depressant properties, Davana essential oil actively engages in relaxing your nervous system and induces tranquility in the mind. As a medicinal herb that adorns the deity of Lord Shiva, it provokes divinity, spirituality, peaceful synergy and positive energy in every individual. Add 2 drops of Davana oil in warm bathing water or mix 6 drops of this oil with 3 ml of sesame oil and go for an energizing massage for treating depression and other mental woes. Davana essential oil grants a soothing effect to the mind and body by effectively alleviating pressure in case of stress, anxiety and rejuvenates the mental health of those who feel depressed and lifeless. You can also add 2 drops of Davana oil to diffuser or burner and inhale it’s comforting fragrance, through which the aromatic molecules present in this oil pass through the nasal passages and reach the limbic system, the control center of human brain. Nature has gifted humanity with some excellent medicines for treating complex womanly problems like menstrual difficulties, menopausal problems and emotional woes associated with such disorders. 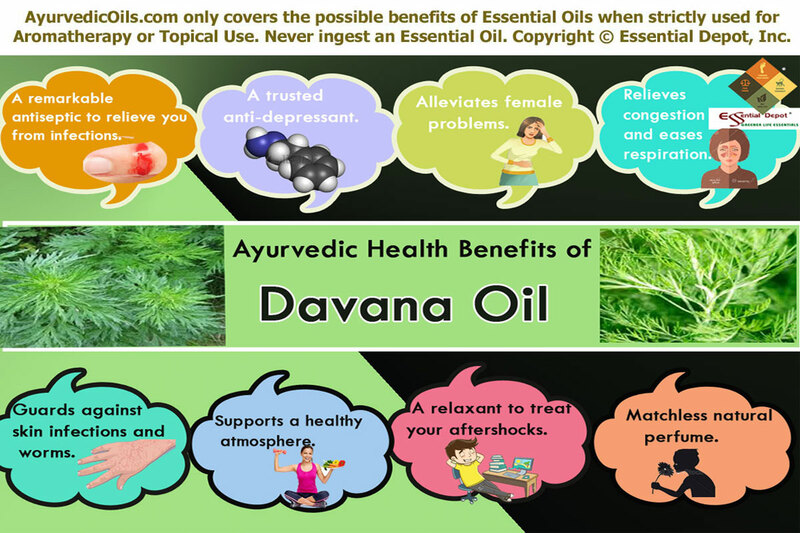 Davana essential oil is one such curative power, which with its emmenagogue property regulates the flow of blood in the uterus and pelvic area and releases blocked menstruation, resulting in a regular menstrual cycle. Massaging your lower abdomen with 2 drops of Davana oil blended with 1ml of sesame oil can act as an effective remedy in treating menstrual spasms, pain in the abdominal area, fatigue, nausea, muscular cramps, restlessness and mood swings. Excess of kapha dosha along with viral and bacterial infections result in cough, cold, congestion and other respiratory illnesses. Severe infections may lead to deposits of mucus and phlegm in the upper respiratory tract and the lungs, causing respiratory disorders and breathing difficulties. Davana essential oil is known to pacify excess kapha dosha with its decongestant and expectorant properties and helps in expelling heavy deposits of mucus and phlegm in the nasal passages and lungs by lubricating the respiratory tract. This oil also has antiseptic, anti-bacterial, anti-viral and antimicrobial properties that destroy such harmful microbes causing respiratory problems. Add 2 drops of Davana oil in steam inhalation for relieving from asthma, bronchitis, cough, cold, breathing difficulties, headache and respiratory spasms. You can also add 2 drops of this oil in vaporizing ointments or cold rubs and gently massage it on your chest, back and throat for effective relief. Being an antiseptic, Davana oil fights against infections and protects your skin from infection prone conditions such as acne, boils, pimples and even stretch marks. It is also vulnerary in nature and aids in speeding up the healing process of wounds and cuts. Mix 2 drops of Davana essential oil in your regular skin care cream or with 1 ml of jojoba oil and apply it on your skin for treating rough, dry and chapped skin. This oil also aids in stimulating the endocrine system. Davana essential oil is further enriched with its anthelmintic and stomachic properties that fight against worm infestation caused by parasites such as round worms, whip worms, hookworms, thread worms, pin-worms and tape worms. 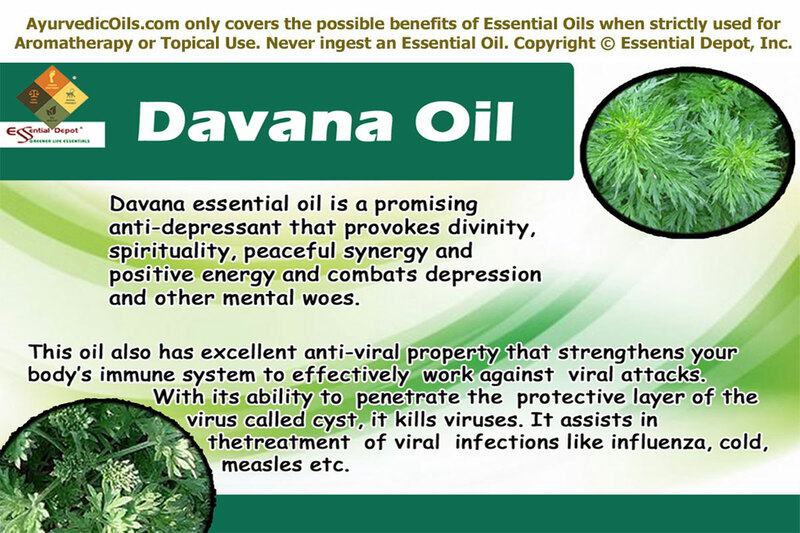 Excelling in its disinfectant properties, Davana essential oil can work wonders to purify your atmosphere. The fragrance of this medicated oil spread so quickly and kills the germs and microbes present in the air with its remedial qualities. Add 2 drops of Davana essential oil in fumigants, sprays or vaporizers for fresh and germ-free environment. Davana essential oil has anti-inflammatory and relaxant properties that effortlessly relaxes the contractions in muscles, blood vessels and also calms down the brain and your nervous system. Massaging your body with 5 drops of Davana oil blended with 2.5 ml of almond oil assists in rejuvenating the nervous system and grants absolute solace. It acts best in inducing mental peace and helps in recovering from after effects of shocks, trauma, heavy medications and treatments, disappointments, failures etc. Davana essential oil stands unique in the field of perfume industry for its fragrance differs with the uniqueness of the individual thus making each one special in their own way. A single plant can scent the entire garden. Hence it is used in the manufacture of high quality perfumes and cosmetics and also in food industries, flavoring tobacco, pastries and some beverages. As per a 1996 research published in Pubmed, Davana essential oil is said to lower glucose level in the blood thereby helpful in treating diabetes mellitus. A 2011 study on the antioxidant property of Artemisia pallens states that it possesses antioxidant properties due to the presence of phenols that effectively reduce the risk of chronic diseases, cardiovascular disorders and cancer. This oil also has mild insect repellant property. Aromatherapists use Davana oil for its antispasmodic properties in treating spasms and pains. It is used in manufacturing vaporizers, disinfecting sprays and room fresheners. The Davana flowers represent a symbol of tradition and are used in making garlands, floral decorations, bouquets and also for various other religious rituals and customs. This article is only for the purpose of information and is not meant to diagnose or replace any professional medical advice or prescribed medication. Never use essential oils internally. Always remember to dilute essential oils before topical usage, as pure and organic essential oils are highly concentrated liquids and may cause skin irritation or other side effects if used in an undiluted form. Always consult your Ayurvedic expert before using the right essential oils for your health condition and unique individual constitution. Influence of plant growth stage on the essential oil content and composition in Davana (Artemisia pallens wall.) published in Pubmed. Antimicrobial Screening of Medicinal Plant – Artemisia pallens by the Department of Chemistry, S.P. College, Pune, India. Study on Effects of Artemisia pallens Wall. on blood glucose levels in normal and alloxan-induced diabetic rats by Division of Ethnopharmacology, Tropical Botanic Garden and Research Institute, Palode, Kerala, India published in PubMed.